The birthplace of Charles Dickens, in Commercial Road, is now a small museum dedicated to his life and works. Fully restored and furnished in the style of period. 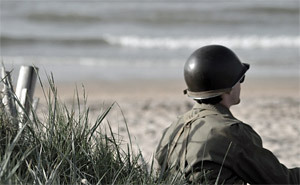 The D-Day Museum, retells the story of the D-Day invasion, plus a re-creation of life in wartime Britain. A key exhibit is the Overlord Embroidery, some 272 ft (83 metres) long. Its 34 fine needlework panels depict events during the Allied landings in Normandy in 1944. Rising to an impressive 560 ft (170 metres) above the sea. One of Britain's highest viewing platforms. On a clear day you can see for miles around and also down to the quay below, through its glass floor. Allow approximately 1 hour for your visit. 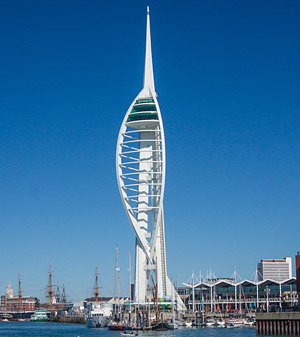 Parking: The closest car parking is available at the Gunwharf Keys underground car park, Portsmouth, PO1 3TZ. Covers over 800 years of maritime history. A number of iconic warships, including the Mary Rose, HMS Warrior and HMS Victory are on display, including submarines and museums. 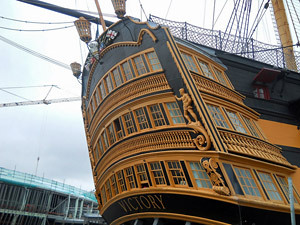 The famous HMS Victory lies peacefully at anchor in the oldest part of the docks. Fully restored and fitted out to reflect the living and working conditions of the time. The preserved remains of the Mary Rose, are housed alongside the Victory in a climate controlled building. She sank in the Solent on her maiden voyage, when sallying out to repel the French in 1545. There is also an exhibition of the thousands of artifacts recovered from the wreck, including several massive bronze guns, a pewter tankard, a set of rosary beads and a pocket sundial. In an adjacent dock is HMS Warrior, the world's first iron-clad battleship, launched in 1860. National Museum of the Royal Navy, displays artifacts pertaining to Lord Nelson and 18th-century naval life. Includes a collection of model ships and figureheads, plus a splendid panorama of the Battle of Trafalgar. Portsmouth natural history museum is housed in handsome mid-19th-century villa on the south sea front. 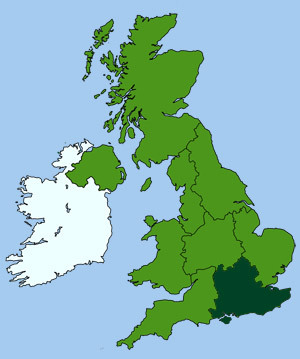 Covering native flora and fauna, it has a considerable variety of stuffed animals, skeletons and other natural history specimens collected from around the south east of England. The Roman Catholic Cathedral is Victorian church, consecrated in 1887, with a fine wood vaulted ceiling. Located in Edinburgh Road (PO1 3HG). The striking Anglican Cathedral (shown left) is the 12th century parish church of St Thomas a Becket , which became a cathedral in 1927. Located in the High Street (PO1 2HH). 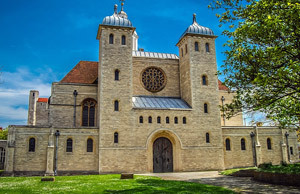 Learn more about Portsmouth's fascinating past. The museum contains a varied and interesting and collection of artifacts that chart the city's history through the ages. Constructed in 1418 as part of the town's defences to protect the entrance to the harbour. At the top is a panoramic viewing point providing spectacular views across the harbour. 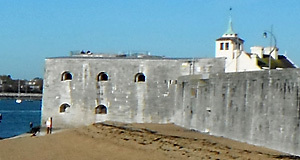 Built by King Henry VIII as one of a chain of coastal forts for protection against French raids. It was from these very ramparts that Henry witnessed the sinking of his flagship the Mary Rose.